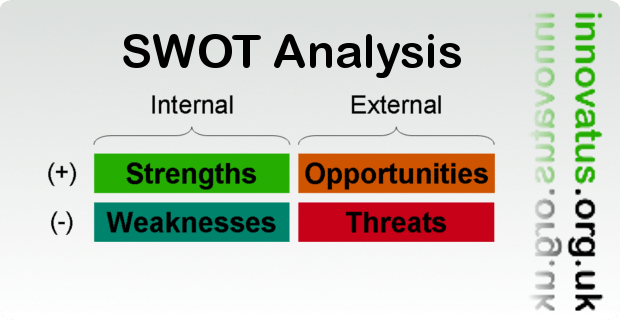 SWOT analysis is perhaps one of the most well known tools for analysing any given situation. Unfortunately its ubiquity has led to a number of downfalls. First there is the apparent confusion between strengths and opportunities and between weaknesses and threats. As a result, a lot of SWOT analysis actually turns into the creation of two simple lists, ‘good’ and ‘bad’. However, this misses the internal / external split which is meant to characterise the analysis. Strengths and weaknesses are about internal factors, whereas opportunities and threats are about external factors (see diagram below). Second, the problem cited above and others like it often leave people dissatisfied with the results produced. Unwittingly responsibility for these poor results are assigned to the tool, rather than the one who wields the tool. The outcome of this is that SWOT analysis can gain a reputation as being a bit of a gimmick. In the next post on this topic we will look at a further problem sometimes encountered, which focuses on next steps. SWOT analysis is still powerful and when done right can be a really useful tool.